Two entry doors, a private bunkhouse, plus double slides! 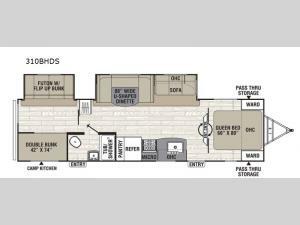 This travel trailer has it all and it's ready when you are. The kids will love the bunkhouse that includes a slide out, double bunks on one side and a futon with a flip up bunk above on the other side, so they can invite their friends. The full bath is right next to the bunkhouse which makes it convenient for the little ones to use the restroom at night. The large slide out in the living room contains the 88" wide u-shaped dinette and the sofa, which can be converted into additional sleeping space. You'll enjoy a queen bed in the private front bedroom and this unit also includes a camp kitchen for breakfast outside! With any Freedom Express Ultra Lite travel trailer by Coachmen you will appreciate of ease of towing behind your family vehicle. All the tanks are located under the floor to lower the center of gravity for increased storage capacity and improved handling down the road. Inside, you'll enjoy features such as, LED lighting throughout, Congoleum Designer Carefree Flooring, an LED TV, plus a 6 cu.ft. double door refrigerator to name a few. The pass through storage with an LED light strip allows you to easily bring along those larger camping items, plus there is an electric awning with LED lights outdoors as well as an exterior shower station to wash off your hiking boots. Come see how you have the freedom to explore in a Freedom Express Ultra Lite travel trailer today!